After getting the original Lego UCS X-wing and TIE Interceptor back around 2000, I passed on most of the others, including the previous UCS Snowspeeder. But once Lego announced a new version of the X-wing, TIE Fighter, Slave 1, and now the Snowspeeder, I just couldn't resist! I was actually hoping this year's release would be a new UCS Millenium Falcon, but that was not to be. But Lego have still done a stellar job with this new Snowspeeder! I ordered the set directly from the Lego online store using VIP points that I accrued from the previous UCS sets. 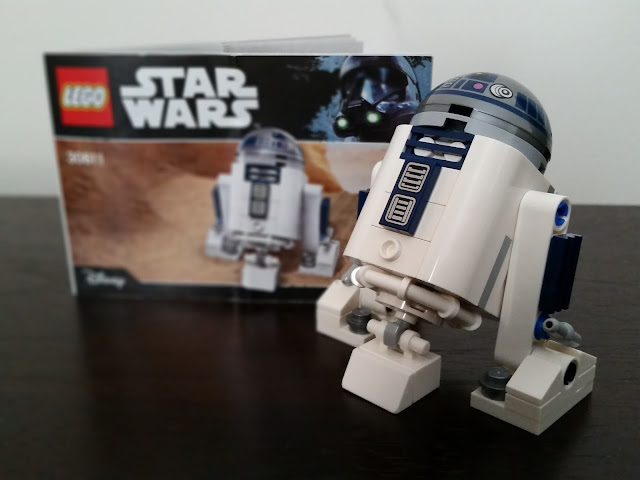 They threw in the new 30611 R2-D2 set, which was a nice little build. I thought it was actually just a mini-figure, but the build was a nice treat. Here's the finished R2-D2, which is pretty nice for a freebie given out with the Snowspeeder! Shame the centre leg can't really retract, but that's a minor nit to pick. But onto the main attraction! First up, I had no idea who the mini-fig pilots were until I read the instruction manual. I never realised Rogue 2 from Hoth (who located Han and Luke in the snow) was called Zev Senesca. I don't think his name is ever mentioned in the movie. He has the darker helmet of the two, and I still have no idea who the other pilot is meant to be. Both have nicely printed labels on their outfits, and suit the display stand well. The build for the Snowspeeder was pretty straight forward, and throughout Lego made sure to include some nice moments. There were definitely some engineering design elements that surprised and impressed me. Of note were the way in which the ball joints are used to create the angles at the front of the craft, the way the gears and rear thrusters rotate together to open up the wing flaps, control within the cockpit of the rear harpoon gun, and the design of the cockpit itself. A controversial point was the use of rubber bands to close the gap of the underside wings against the top folding wings. I worry about the longevity of the rubber bands, but there's not too much tension in them. I still think Lego could've used the usual angle brackets, but I guess they used the bands to make a perfect alignment of the top and bottom wings. The rear vertical fins fit in nicely and were a separate component to build. Inserting them into the main body was a bit of a pain, so be careful where you put your hands to apply pressure. As I mentioned before, the front angular panels were created using ball jointed panels, which was a great idea to allow easy adjustment of the panels. Overall I think it makes the front look better than the original set. I also love the subtle angle of the laser cannons on top of the wings. It was great seeing how all the separate parts connected together along the length of the wing. Perhaps my only other nitpick is Lego's continued use of stickers. I really wish they would just tamp all their decals and save collectors the hassle of trying to align things perfectly. But again, in the overall scheme of things, that's not too big a deal. On display, the size and detail are right up there with the other recent UCS sets, and make for a great Star Wars display. Hopefully they announce a new Millenium Falcon soon so that I can start saving!